Award-winning journalist, travel writer and photographer. The Jerusalem residents I have had the chance to meet all have one thing in common: they have a sense of humor about the absurd. The more time you spend there, the more you realize how absurd it truly is. Absurdly beautiful. A couple of years ago I encountered this group of teenagers who do parkour in their spare time. That’s the sport where people use urban settings to jump around. These parkour athletes were as young and reckless as teenagers you’d find anywhere: they didn’t care that they had no protective equipment or significant training. They let me photograph them for hours as they jumped dangerously off and over some rooftops in the Old City. I never stopped to think that we might be running on the rooftop of people’s homes. When you’re inside the Old City it feels like normal life is somehow suspended. And normal rules, like running on people’s rooftops. When the kids were leading me up to the rooftop they raced through the streets of the Old City like they were running through their backyard. It was for some of them. I could tell that he had been taught to love and treasure the place and everything inside its walls like you would a sweet old friend. No judgement for its many, many flaws (keep in mind the Old City is a flashpoint for violence, particularly in times of regional unrest). I hadn’t even noticed a smell until he said something. Then it hit me like a ton of bricks. That afternoon photographing those teenage boys as they leapt in the air like superheroes while taking time to admire the heart of their city was better than a top-dollar tour. That is the beauty of crazy Jerusalem, she has the ability to truly surprise you. At a very basic level, there are good reasons for the debates. There is good reasons for all the uproar about the American embassy being moved from Tel Aviv, where almost every other embassy is located. A couple of less powerful nations followed suit when the current administration made the dramatic choice to relocate the embassy. A foreign embassy location is significant in that it demonstrates a recognition of a certain status of national political life vis-a-vis international norms and laws. For embassies of most nations to be located in Tel Aviv signals a tacit support for a future two-state (Jewish-Palestinian) solution. We can dream, right? A foreign embassy located in Jerusalem is a very intentional move meant to send a message: that Jerusalem is the capitol of Israel. Make no mistake – the message itself is rhetoric. Jerusalem’s history is long and winding and full of hidden corners and untold stories that lend context and relevance to modern debates like the American embassy location. But one thing is for certain: Jerusalem is a city (more like an entity) that belongs neither to Israel nor to the Palestinians and any future state they might form. As best I can tell after years of living and working in Jerusalem and writing about its people and dramas and history – my conclusion is that Jerusalem belongs to herself. The street musician world of Jerusalem is prolific, varied, talented, and extraordinarily interesting. They have no politics to espouse when they perform. Violinists, guitarists, singers, all play because they want to. Many perform at some of Jerusalem’s open mic sessions at different places in the city. Their performances are free, unless you want to tip. It’s some of the best local color that the city has to offer. However, when the story was published, words had been added to make it more dramatic, more interesting, more violent. Words that evoke fighting and conflict were added, and a photo of a religious man was made the lead image. There’s nothing wrong per se with framing a story about street musicians in the context of the geopolitical situation. Whatever works for that publication, really. But there are times when it gets to be ridiculous. This was one of them. Music is music is music. Yes, it can be used to influence and incite. But not in this case. One street musician, a close friend, told me that he plays in Jerusalem on the streets because he simply must. In his case, there is a spiritual connection to the city that motivates him. I wish editors at that publication would have emphasized that – spiritual connection – instead of what they did – social disconnection. Open House Jerusalem is a chance to find out. The tours for Open House Jerusalem are increasingly popular, particularly among locals, and take place this year from October 22-24. That’s a Thursday through a Saturday. The start of the workweek in Jerusalem is on Sunday, so Open House Jerusalem is mostly on the weekend. For those not familiar with the rhythm of the very religious city, the weekend in Jerusalem means less vehicular traffic. There is also no public transportation and fewer taxis (at a higher rate) from sundown on Friday to sundown on Saturday. American Colony Hotel via Wikimedia Commons by Magister. Aside that one small complication, some of the tours for Open House Jerusalem have limited capacity and fill up quickly. All tours are free, but some require registration in advance, which begins on Friday, October 16. About 100 sites are covered, so it is possible to find more than enough to entertain and fascinate even if a first choice is unavailable. Jerusalem’s urban architecture reflects its role as home to about 1 million people and with a history that spans thousands of years. The Open House Jerusalem tours only go back to the 19th century, but feature some of the most modern architecture the city has to offer. Some highlights from the 2015 Open House Jerusalem catalog include the neighborhoods of the German, Greek, and French Colonies, Baka, the Old City, East Jerusalem, City Center, and more. While tours in the neighborhoods afford glimpses into private homes and a wide variety of architectural styles, the Old City’s ancient offerings of massive buildings are always a huge draw. The “Preservation Issues in the Old City” guided tour will lead people through the various problems that the Israel Antiquities Authority faced when working on projects in the area near Mount Zion and Jaffa Gate. 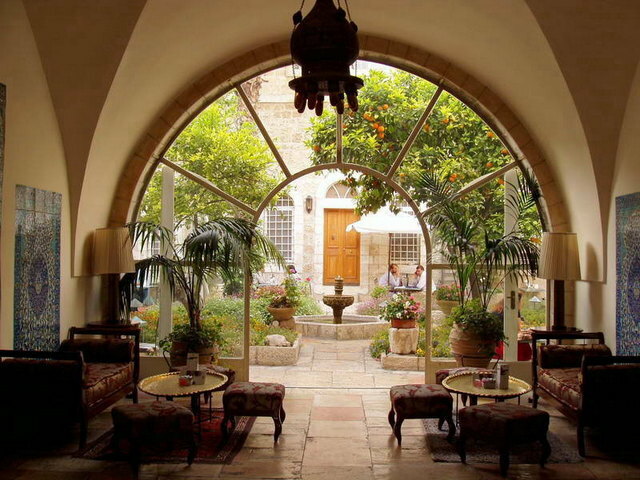 There is also a discussion with an architectural firm planning for the Arab population in East Jerusalem, and tours of various well-known buildings in the area including the iconic American Colony Hotel, the Rockefeller Museum and more. Subscriptions for the Open House Jerusalem email list are available by contacting hfw.israel@gmail.com.